The implementation of Belfast Rapid Transit (BRT) started in 2014 and was progressed as a series of schemes which are outlined below. The BRT Glider services started on 3 September 2018. The 520 space Dundonald Park & Ride site was officially opened by the then Transport Minister, Danny Kennedy MLA on 1 December 2014. Dundonald Park & Ride is a key part of the BRT system. Secure bicycle parking facilities are also provided. Minor carriageway widening and drainage system enhancements which facilitated the introduction of BRT bus lanes in both directions. Resurfacing of almost 1km of carriageway and adjoining footways. Three existing pedestrian crossings upgraded to Puffin crossings and one new Puffin pedestrian crossing provided near Ormiston Crescent. Street lighting and traffic signal equipment upgraded to energy efficient LED along entire section. Minor carriageway widening and drainage system improvements which enabled the extension of BRT bus lanes in both directions. Resurfacing of almost 1.4km of carriageway and adjoining footways. All existing pedestrian crossings upgraded to Puffin crossings. Street lighting and traffic signal equipment upgraded to energy efficient LED along the entire section. Minor carriageway widening and drainage system improvements which enabled the extension of BRT bus lanes in both directions. Resurfacing of 1.2km of carriageway and adjoining footways. Improvements to the traffic signals and pedestrian crossings at the Holywood Road, North Road and Sandown Road junctions. Upgrade of all existing pedestrian crossings and provision of an additional pedestrian crossing near Ebrington Gardens. Upgrade of street lighting to LED along the entire section. Minor carriageway widening and drainage system improvements. Resurfacing of 1.4km of carriageway and adjoining footways. The new bus lanes on this section of the BRT route were introduced on 13 February 2017. Improvements to the traffic signals and pedestrian crossings at the junctions along the route. Upgrade of all existing pedestrian crossings and provision of an additional pedestrian crossing near Townsend Street. Upgrade of street lighting to LED along the entire section. Carriageway widening and drainage system improvements. The new inbound bus lane was introduced on 17 April 2017. Resurfacing of 1.8km of carriageway and adjoining footways. Improvements to the traffic signals and pedestrian crossings at the Suffolk Road, Blacks Road and Finaghy Road North junctions and provision of a new signalised junction at Shaw’s Road. Upgrade of all existing pedestrian crossings. Upgrade of street lighting to LED along the entire section. Minor carriageway widening and drainage system improvements. Resurfacing of 0.9km of carriageway and adjoining footways. The new bus lanes on this section of the BRT route were introduced on 14 August 2017. Improvements to the traffic signals and pedestrian crossings at the junctions along the route. Upgrade of all existing pedestrian crossings. Upgrade of street lighting to LED along the entire section. Minor carriageway widening and drainage system improvements to enable the introduction of an inbound BRT bus lane. Resurfacing of approximately 2.1km of carriageway and adjoining footways. Upgrade of all existing pedestrian crossings and provision of an additional pedestrian crossing near Michael Ferguson Roundabout. Upgrade of street lighting to LED along the entire section. Minor carriageway widening and drainage system improvements to enable the extension of BRT bus lanes in both directions. Resurfacing of approximately 2.8km of carriageway and adjoining footways. Signalisation of the existing roundabouts at Falls Road/Whiterock Road and Andersonstown Road/Kennedy Way junctions. Upgrade of all existing pedestrian crossings and provision of an additional pedestrian crossing in the vicinity of Falls Park. Upgrade of street lighting to LED along the entire section. Minor carriageway widening and drainage system improvements to enable the introduction of BRT bus lane services. Resurfacing of carriageways and adjoining footways. Upgrade of existing pedestrian crossings and signalised junctions and provision of additional pedestrian crossing facilities where required. Installation of new Glider halts. Minor carriageway widening and drainage system improvements to enable the extension of BRT bus lanes in both directions. Resurfacing of approximately 3.5km of carriageway and adjoining footways. Improvements to the traffic signals and pedestrian crossings at all the junctions along the route, including introduction of dedicated right turn lanes at the Stoney Road and Comber Road junctions. Upgrade of all existing pedestrian crossings and provision of an additional pedestrian crossing near Rosepark. Upgrade of street lighting to LED along the entire section. Construction of a Transport Hub building and adjacent Public Square, supported by the Executive Office’s Urban Villages programme. The Transport Hub building includes a waiting area for Glider passengers, information, public toilets and driver facilities and is the interchange point between the main Glider services and the feeder services for the Colin area. It also includes community space and, along with the adjacent public square, will be used for various community events. As the Department’s BRT project progressed, a number of key events took place and press releases were issued. These are outlined below by way of a timeline of the project. The Department has been successful in securing €17 million of European funding for the Belfast Rapid Transit project. This project is part-funded by the European Regional Development Fund, through the Investment for Growth and Jobs Programme for Northern Ireland 2014-2020. The funding will contribute to three main areas of the project: the Milewater Service Centre where the Glider vehicles will be stabled and maintained; the new Glider off-board ticketing system; and the new Glider halts. The Department advertised 2 Traffic Regulation Orders in December 2017 – The Bus Lanes (Belfast City Centre) Order (Northern Ireland) 2018 and The Bus Lanes (Belfast Rapid Transit, East and West Corridors) Order 2018. Both of these consultations closed on 12 January 2018. The new Glider vehicle was available for public viewing in Custom House Square on 13 and 14 December 2017. The new Glider vehicle was unveiled on 19 October 2017 at the Busworld Europe exhibition in Belgium. The Department issued a press release on 19 October 2017. Full details are available New Glider vehicle unveiled. The Department issued a press release on 7 August 2017. Full details are available New Bus lane in East Belfast. The Department issued a press release on 11 April 2017. Full details are available New bus lane in West Belfast. The Department sought views on its proposals for the operating hours of the BRT bus lanes and associated changes to waiting restrictions. The online informal consultation documentation included general information on the BRT system and its benefits, details of the Department’s proposals and a short questionnaire. The views expressed in response to the informal consultation were used to develop the final proposals for the formal legislative process. This Public Information Event provided details of the BRT CITI route which will connect the route in East Belfast and the route in West Belfast to the city centre and Titanic Quarter. The Department issued a Press Release on 24 January 2017. Full details are available Minister seeks views on BRT Bus lanes. This Public Information Event provided details of the section of the BRT route on the Stewartstown Road between Michael Ferguson roundabout and McKinstry Road roundabout and the new Transport Hub and Public Square at Colin town centre. This public information event provided details of the section of the Belfast Rapid Transit (BRT) route on the Upper Newtownards Road between Knock Road and Dunlady Road. The new bus lanes, located on the Upper Newtownards Road between Holywood Arches and Sandown Road, were introduced on Monday 27 June. Further details are available via the Press Release. This public information event provided details of the section of the BRT route on the Falls Road and Andersonstown Road between Whiterock Road and Finaghy Road North. 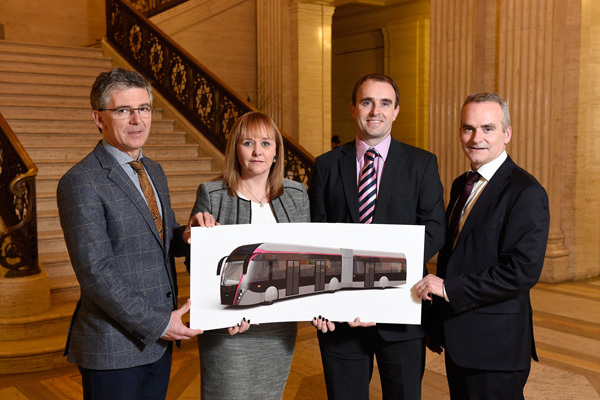 Transport Minister Michelle McIlveen has announced the award of a £19 million contract to supply a fleet of 30 vehicles for the new Belfast Rapid Transit (BRT) system. This public information event provided details of the section of the BRT route on the Albertbridge Road between the Albert Bridge and Newtownards Road. On 16 September 2015 the Department announced a change to the proposed operational date for the BRT system. The system is now scheduled to become operational in August 2018. The potential for delay was set out in the Department’s consultation on the draft budget last November and severe budget pressures remain on the Department and there is no certainty about the position for future years. The programme for delivery of BRT is complex with multiple workstreams and inter-dependent projects to be delivered. We are continuing to work to address outstanding issues and implement recommendations from a recent independent review of the programme. That review confirmed 2018 is achievable provided key issues are addressed. The Department briefed the Committee for Regional Development on the revised operational date on 16 September 2015. This public information event provided details of the section of the BRT route on Divis Street/Falls Road between Millfield and Grosvenor Road. This public information event provided details of the section of the BRT route on the Upper Newtownards Road between Albertbridge Road and Sandown Road. This public information event provided details of the section of the BRT route on the Andersonstown Road/Stewartstown Road between Finaghy Road North and Michael Ferguson Roundabout. This public information event provided details of the section of the BRT route on the Falls Road between Grosvenor Road and Whiterock Road. This public information event provided details of the section of the BRT route on the Upper Newtownards Road between Sandown Road and Knock Road.